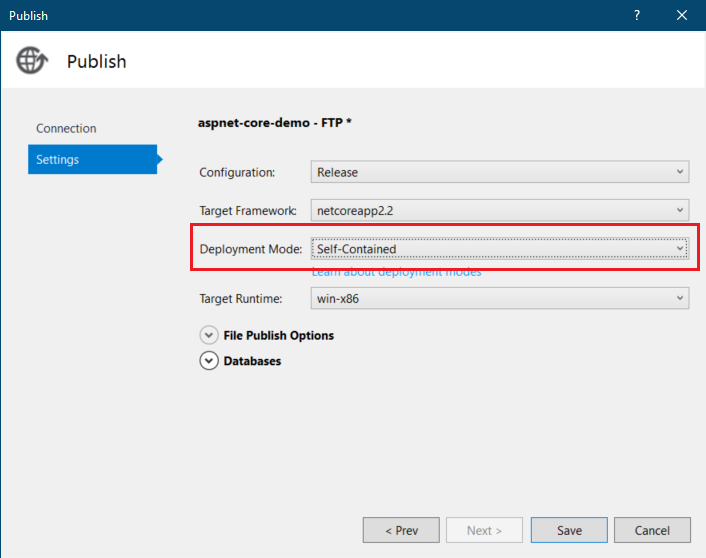 In this post I am deploying an ASP.NET Core 2.2 Preview Web API to Azure web app. You can deploy the ASP.NET Core preview versions using following three approaches. Install the preview site extension. Use Docker with Web Apps for containers. You can install the Azure Web App extension for ASP.NET Core preview. From the Azure web app overview, search for extensions. Click on the Add button, from the Add Extension blade, select the choose extension menu. And select the ASP.NET Core runtime - based on the Web App platform. 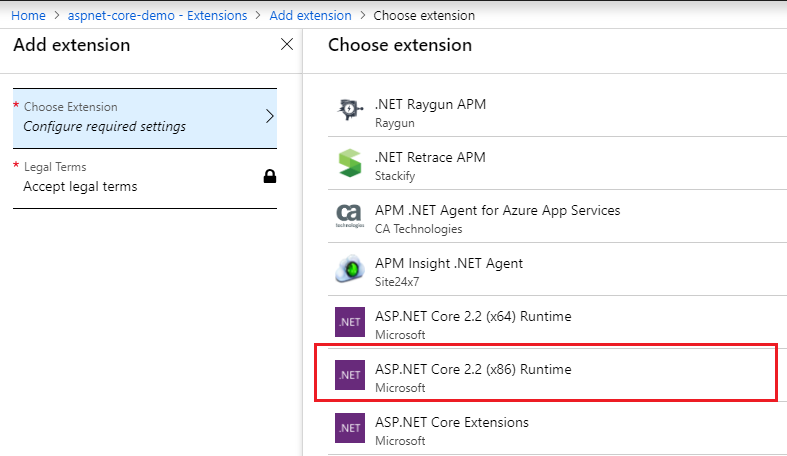 Since I am using free plan, I am selecting ASP.NET Core 2.2 (x86) Runtime. Next click on the Accept legal terms. Once it is done, you can click Ok, this will install the ASP.NET Core extension in Azure web app. Once it is installed you can publish the app from visual studio using the Publish wizard. If you don’t want to enable ASP.NET Core extension, other option is publishing the app as Self Contained. In Visual Studio, you can configure it in the Publish Wizard, select Settings, and choose Deployment Mode as Self contained. If you’re not using Visual Studio, you’re using VS Code or CLI, you can modify the CSProj file and include <RuntimeIdentifier> and specify win-x86 there. And you can publish using dotnet publish command or you can directly publish using dotnet publish --configuration Release --runtime win-x86 command. Once the publish finished, upload the files from Release/win-x86/Publish folder. The Docker Hub contains the latest preview Docker images. The images can be used as a base image. Use the image and deploy to Web Apps for Containers normally. Using the above methods you can deploy apps built on top of preview versions of .NET Core. In the above mentioned methods, which one is good? Depends on your app and features. I prefer the extension method, other two requires some additional steps in the development or build process.